Uttar Pradesh Public Service Commission has uploaded the results of Staff Nurse (female) examination conducted on 17th December 2017. Results have been provided on the official website of the commission i.e. uppsc.up.nic.in. The list contains roll number, registration number and name of all the selected candidates. Lists for the Staff Nurse (Female) Medical Education & Training, Uttar Pradesh and Staff Nurse (Female) Medical Health Services, Uttar Pradesh separately. Out of 100 marks, the written examination has been given the weightage of 85 marks. For Medical Health Services, a total of 1830 candidates have been shortlisted for 3628 vacancies while 558 candidates are shortlisted out of 753 vacant posts in Medical Education & Training. In the merit list, candidates who have scored more than the minimum required marks are shortlisted, Candidates belonging to General category/ Other Backward Classes had to score 40% marks at least while those belonging to SC/ ST category had to score minimum 30 per cent marks. Category wise/ post wise cut off marks of the written examination will be uploaded on the official website very shortly. The commission has provided the results through online mode. First of all, candidates need to visit the official website of the commission – uppsc.up.nic.in. When the website opens, candidates should search for the “RESULT OF ADVT. NO. A-1/E-1/2017, STAFF NURSE (FEMALE) EXAMINATION 2017″ link. Applicants need to press that link. Then, the PDF file will open in which, all the selected candidates are shortlisted. Candidates should check their roll number and name to confirm whether they have qualified or not. 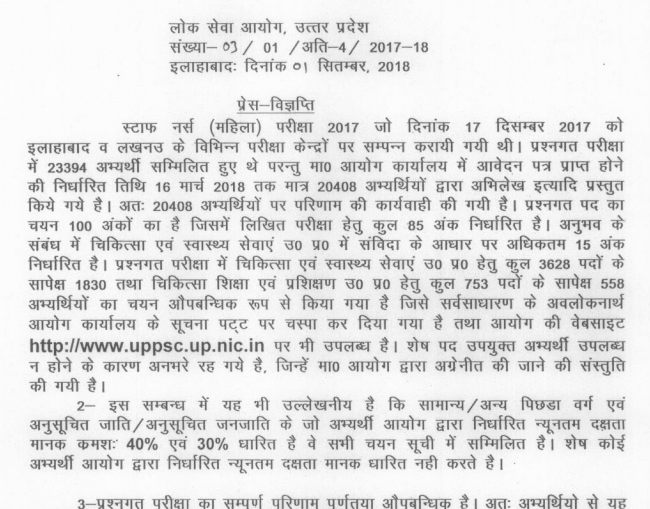 The official notification for the staff nurse recruitment was published by the Uttar Pradesh Public Service Commission on 12th January 2017. As per the notification, all the eligible candidates had to submit their applications before 13th February 2017. And, the last date for receipt of examination fee in the Bank was 9th February 2017. Selection of candidates is purely on the basis of merit. Only those candidates are selected who have scored more marks than the minimum qualifying marks. The result notice was issued by Joint Secretary/ Controller of Exam UPPSC, Allahabad.